Advanced directional signage is positioned well in advance of these toll plaza's, and is situated at locations which allow sufficient warning for motorists to exit off the motorway and use the alternative route should they wish not to use the toll motorway. On the approach to the toll plaza, signage is in place advising the customers of the appropriate toll charges, and advising users to get into the appropriate lane. 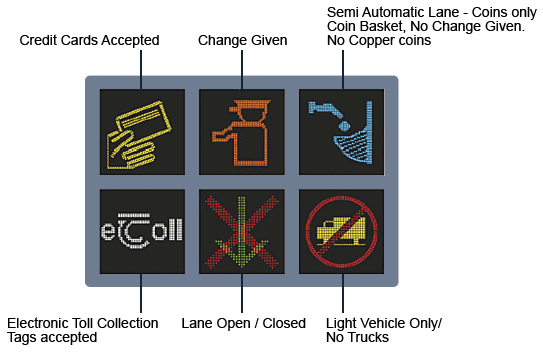 When you enter the toll plaza area itself, canopy signals located above each toll lane will provide you with information in relation to the types of vehicle accepted in such a lane, the mode of operation (manned / automatic), and the means of payment accepted. These signals will enable you to chose the appropriate lane for your transit. We wish to highlight that the mode of operation of individual toll lanes may change from day to day, as sometimes different lanes are opened and closed in the Toll Plaza depending on how busy the motorway is or what time of day it is. When you have made your payment, the barrier will open, and a green traffic signal light will appear and you can proceed.